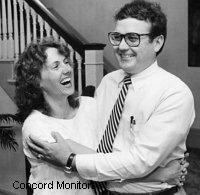 The McAuliffes of New Hampshire exemplify the best of collectivism. Steven is a lawyer who has risen close to the top of his profession, while his late wife Christa rose to the highest point in her life - "a history teacher, making history" as she said herself - at the very moment it was snuffed out in the tragedy of the Challenger explosion, a quarter century ago last week. She had been selected from 11,000 applicants to be the first schoolteacher in space. Steven used to be in private practice, but switched to "government service" and is now Chief Judge on the federal bench in NH. Both, talented people who chose to work for stolen money. Christa is the better known, because of the magnitude of that tragedy, witnessed worldwide as it happened. Subsequently a planetarium in Concord was named after her, to inspire fresh generations with an interest in space. If the Statist religion named saints, she would by now certainly have been canonized. As the Daily Camera put it, "McAuliffe and six others on board perished as the cameras rolled, victims of stiff O-ring seals and feeble bureaucratic decisions." The investigation blamed NASA for launching after a cold night, contrary to the known operational limits of the seals in the solid-rocket boosters - presumably because as well as being a scientific venture the trip had to win and maintain voter support for the Agency's funding. It puzzles me that the plastic was so sensitive to low ambient temperature, when obviously the rocket surface would fall way below freezing a few seconds after launch as altitude was gained, but there it was; PR triumphed over engineering and the disaster ensued. Leading edge exploration will always be hazardous, even after government has evaporated; tension will persist, between meeting deadlines and minimizing risk. But when a project's funding depends wholly on the whim of superficial voters instead of careful owners managing their own investments, the former is likely to predominate. It did, on 1/28/1986. Steven's handling of the Brown case in 2007 is notorious, and cannot be excused by the searing experience of the bereavement he suffered two decades earlier. Ed Brown, IMHO, is a flake. He has one thing straight, namely that no law compels the payment of income tax; but on many other matters he has a bizarre understanding of which way is up. McAuliffe swept aside Brown's forty motions to dismiss, though he's quite bright enough to know that Brown's basic contention - that no statute compelling payment of this tax has ever been found - is exactly right. So at the very least he could have stopped the trial on the grounds that Brown was too insane to defend himself, but more simply and properly dismissed the case outright for want of any law he might have broken. But he did neither, for he knew quite well that as a government agent he was expected to help maintain its revenue stream - the stream that pays his salary, and which paid Christa's - even though that stream had, indirectly, killed her. So he let the trial proceed, with the ultimate result that the Browns are locked up until they are aged 102. The McAuliffes, in their different ways, are poster children for government. What a tragic waste of talent.